Accessibility Tools: How does universal design fit in? How does universal design fit in? 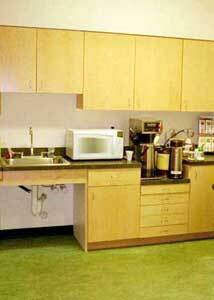 Universal design means designing all programs and facilities to meet the needs of most people. 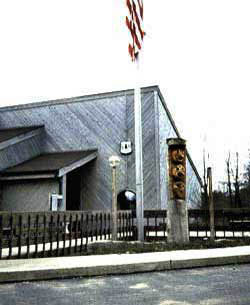 Since the early 1990s, the Forest Service has followed a policy that all new and reconstructed facilities, programs, and associated elements are to be accessible. This commitment exceeds the minimum requirements of the Architectural Barriers Act Accessibility Standards. 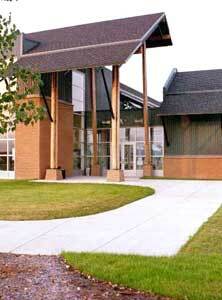 Through the use of universal design, Forest Service facilities and programs provide an integrated experience. New and upgraded facilities don't have separate or "special" entrances, or features for persons with disabilities. The result is independence, integration, and dignity for everyone. The entrance to this district office is universally designed even though it was constructed on a steep hillside. 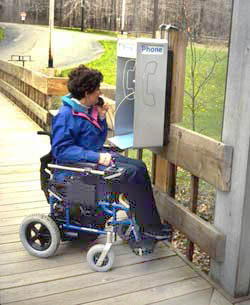 Following the principles of universal design, facilities are constructed so that the entrances require neither steps nor ramps, ensuring that all people can use the same entrance. The interiors are designed so that all individuals can access all areas. If the facility has more than one story, an elevator is provided. All aspects of the accessibility guidelines are met throughout the facility, including the requirements for visual alarms and tactile signage, in accordance with the accessibility guidelines. 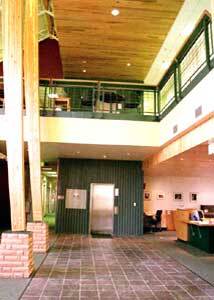 The Missoula Technology and Development Center building was designed and constructed in 2002 using the principals of universal design. Employees have found the universal design features have benefits for everyone.